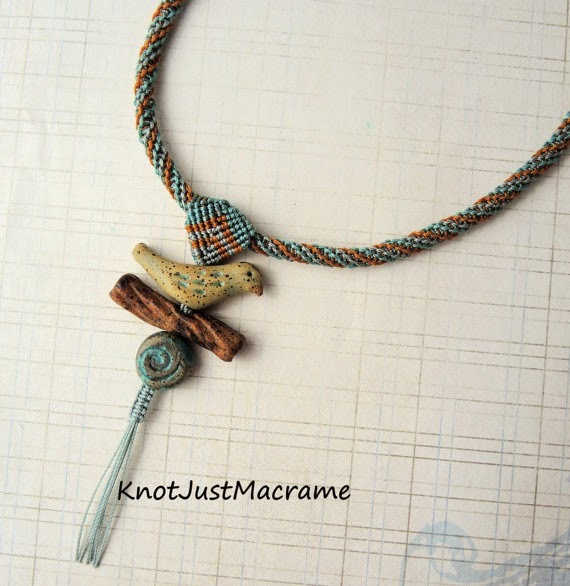 Knot Just Macrame by Sherri Stokey: A Contest, Artisan Beads and Micro Macrame - What's Not to Love! 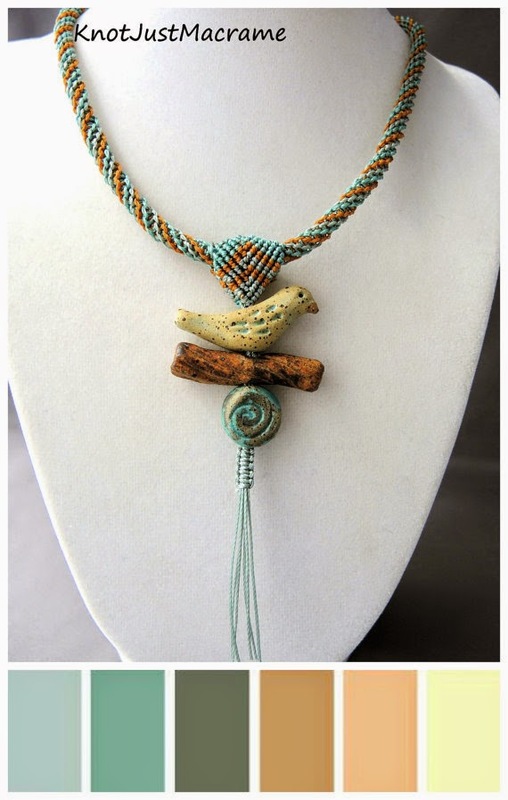 A Contest, Artisan Beads and Micro Macrame - What's Not to Love! Artisan Component Marketplace is a group of very talented artisans who gather on Facebook to buy and sell their handcrafted components. The range of talent there is amazing and several of my favorite bead makers are there. The group recently sponsored a contest requiring only the use of components made by one of the members. I love to work with art beads anyway, so this seemed a convenient excuse to buy more use some. I started with this Enchanted Woodland Bird set by Karen Totten of Starry Road Studio. 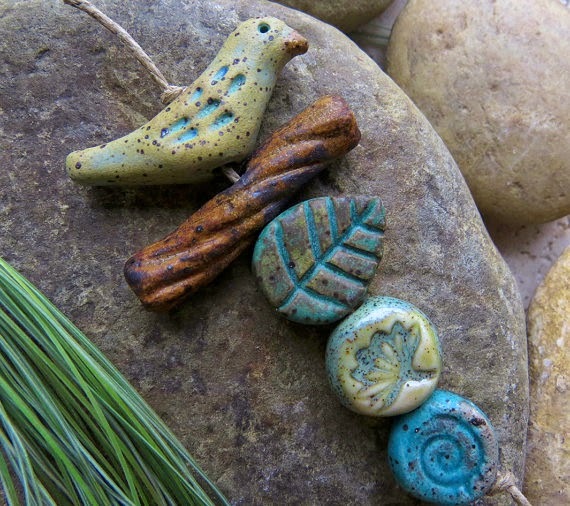 She described it as "A ceramic bird bead set in an palette of mossy woodland colors. These beads made me think of a hike in a forest shaded by tall pine trees, full of mystery and magic!" If the photo hadn't lured me in, the description just might have. 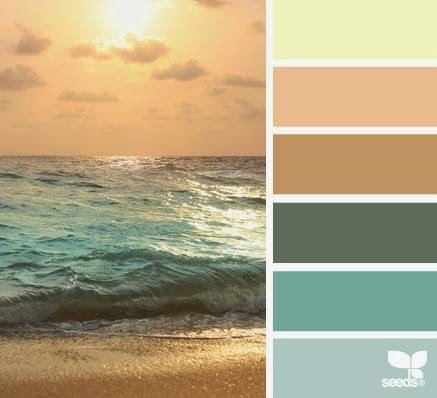 Another group to which I belong, Color Combo Challenge, features inspiration color palettes and it has really helped me to expand and think of colors in combinations I normally wouldn't consider. This palette from Design Seeds really appealed to me and seemed to fit Karen's bead set well. Are you seeing how this could come together beautifully? I certainly could. 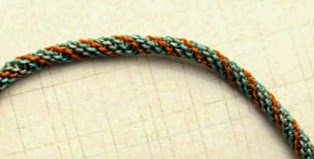 I've really been trying to expand my micro macrame knotting lately with trying out new ideas. I wanted a fairly simple rope for these beads, and what I came up with looks much like kumihimo, but my version is just done with half knots. Matches the palette? Check. Matches the beads? Check. Then I was digging around looking for a bail to hang the beads from the cord and couldn't find just the right thing. Everything I had looked to "fussy" for the look I wanted and somewhere in the midst of this it dawned on me that I could probably knot something that would work. 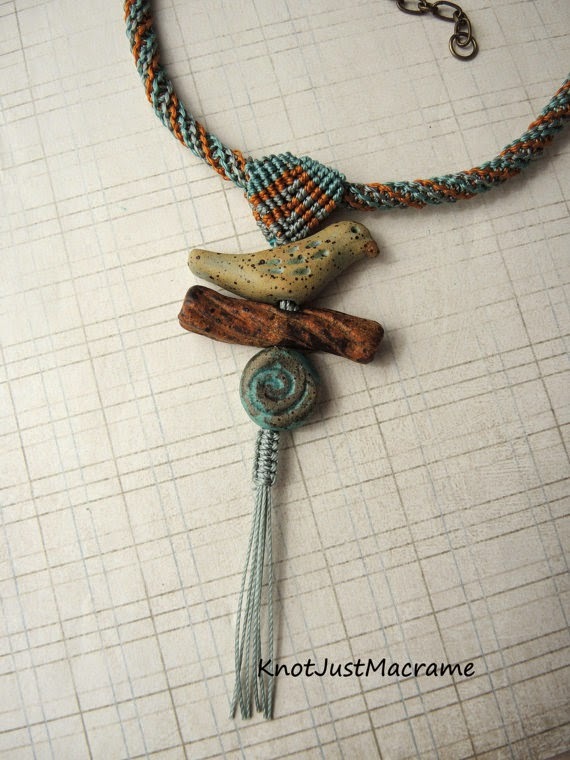 I knotted a piece, then folded it over the rope, threaded the beads on the remaining cords, put a few square knots under the last bead to hold everything in place and left a few cords for a swishy little tail at the end. Simple and effective, I think. 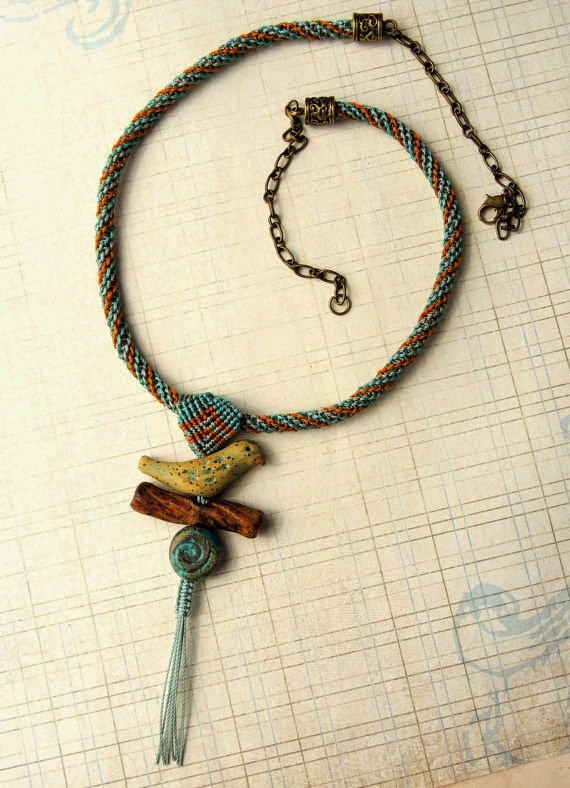 I wanted the wearer to be able to adjust the length of this necklace, so I added some caps to the ends of the rope and a bit of chain on either end. This piece can be worn shorter so the beads fall in the hollow of the throat and nestle in a neckline, or longer to fit on the outside of a collar or sweater. I think this piece turned out beautifully and what's more, the judges from the Artisan Component Marketplace thought so, too. I won First Place and a gift certificate to spend in my favorite component maker's store! And you KNOW how I love to shop for more beads! There are so many talented artists in that group, I am having a terrible time trying to decide which one to chose. Congratulations, I am so proud of you. This is a beautiful necklace and I love the way you described it. Have you decided how you are going to spend your winnings?